It is an input component that provides live suggestions while an input is being typed. Suggestions are loaded by calling a server side completeMethod that takes a single string parameter. 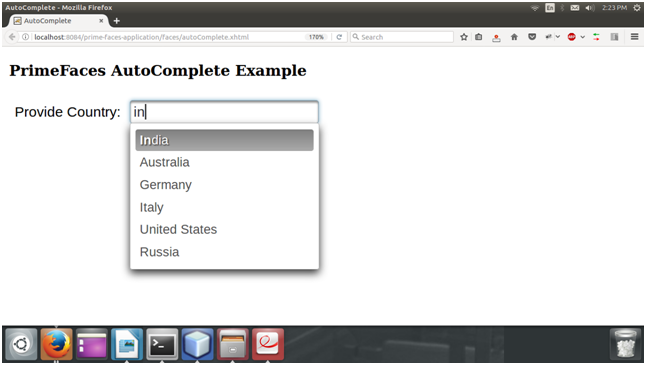 PrimeFaces provides <p:autoComplete> component which is used to create a text box with suggestions. It includes various attribute that are tabled below. The following table contains attributes for the AutoComplete attribute. binding null Object It is used for an el expression that maps to a server side UIComponent instance in a backing bean. value null Object It is a value of the component that can be either an EL expression of a literal text. converter null Object An el expression or a literal text that defines a converter for the component. immediate false Boolean It returns boolean when set true, process validations logic is executed at apply request values phase for this component. required false Boolean It is used to marks component as required. dropdown false Boolean It enables dropdown mode when set true. accesskey null String It is used to set access key that when pressed transfers focus to the input element. autocomplete null String It executes autocomplete behavior. Lang null String It is used to set language used in the generated markup for this component. onclick null String Client side callback to execute when input element is clicked. active true Boolean Defines if autocomplete functionality is enabled. Here, in the following example, we are implementing <p:autoComplete> component. This example contains the following files.